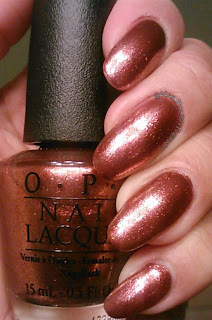 OPI Mariah Carey line Part 1, Something that I don't do is buy the entire line of any brand. There are few lines where I love every single color. 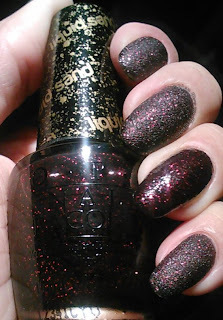 I'm not interested in having a full line just for the sake of having it, but I understand why some nail polish enthusiasts would. They are also probably fortunate enough to get products to review, but this girl tries to be sensible so I stick to what I absolutely love. 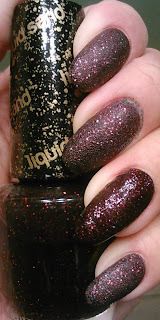 OPI and Mariah Carey teamed up to launch the Liquid Sand polish which I think is going to be the next nail polish effect to spread to other lines in much the same way that crackle and magnets did. 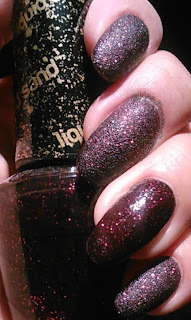 Here are 2 colors from the collection. 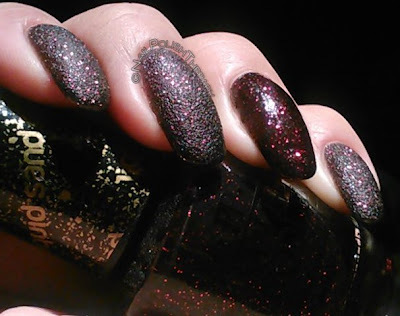 The first one is Stay the Night, which is the black liquid sand with fuchsia pink and silver flecks. 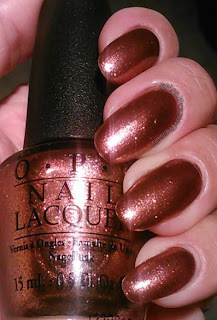 I added a top coat to the ring finger so the difference in texture could be noticed. I really like this effect and it was easy to apply, dried fast and easy to remove. The best part is despite the rough texture, it did not crumble off or scratch me.